As Aladdin says, "You've got to stay one jump ahead of the bread line! One swing ahead of the sword. You got to stay one jump ahead of the slowpokes. One skip ahead of your doom. (Next time you'd better use a nom de plume.)" That's the kind of thing Aladdin has taught us over the years and we can't really argue. He might be a “street rat” and a “one man rise in crime,” but the guy has a monkey for a best friend, a genie pal who can use his magic to help him out of any sticky situation, and his girlfriend is the princess of Agrabah, so we think he has a pretty good grasp on how to live life well. Oh, and did we mention that his ride is a carpet that can fly through the air using magic and can literally show anyone the world? Yeah, he's REALLY got a handle on how to live well! 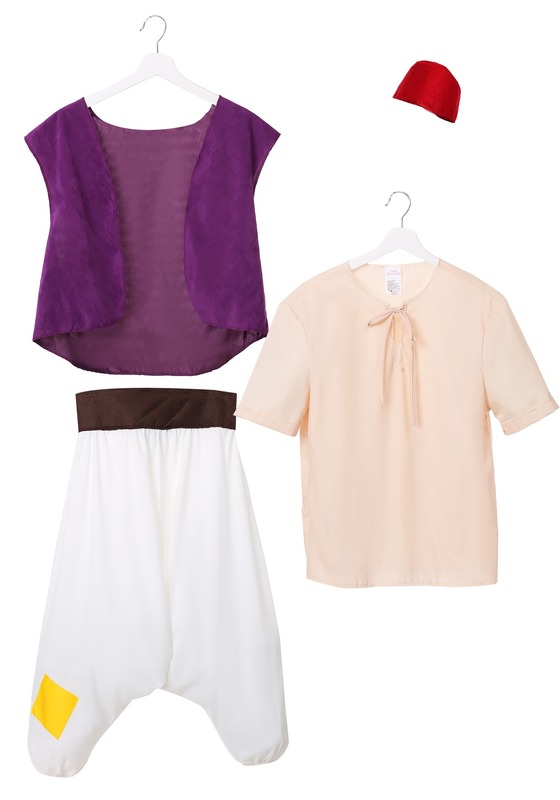 Now, you can take a note from his book (or song) with this licensed Disney costume! 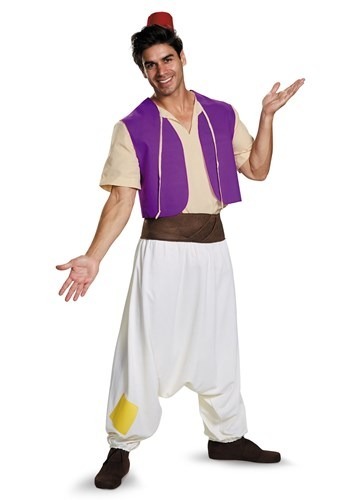 Based on the classic 1992 animated film, this Aladdin Costume gives you the look of a down-on-his-luck Aladdin. The pants have that baggy look from the movie (something we might call "Hammer style" pants) and even come with the patch on the bottom. The look is perfect for traversing strange, treasure-filled caves, or easy living in the streets outside the palace. Of course, if you want to have a monkey for a best friend and Princess Jasmine as your girlfriend, you might have to travel all the way to Agrabah, but with this costume at least you'll have the look all ready for when you finally purchase those plane tickets (or hop on that magic carpet)!